St. Lawrence Island is an island in the Bering Sea just south of the Bering Strait, administratively belonging to the state of Alaska. The Danish and Russian explorer Vitus Bering discovered the island on the feast day of St. Lawrence, August 10, 1728. It is the largest island in the Bering Sea, sixth largest in the United States, and the 113th largest island in the world. It is approximately 125 miles west-southwest of Nome, Alaska. Its northwestern shore is less than 40 miles from Siberia's Chukchi Peninsula. Many believe St. Lawrence Island is one of the last remaining non-submerged portions of the Bering land bridge that once joined Asia with North America during the Pleistocene period. It has been inhabited intermittently for the past 2,000 years by Yupik Eskimos. The cultures of the island's population show links with groups on both sides of the Bering Strait. Extensive archaeological studies have been conducted on the island. These studies note both the archaeological and historical roles in the development of Arctic cultures. During the Cold War, the island's residents were exposed to contaminants from United States military sites on the island that were in use from the 1950s until the early 1970s. Following the base closures, many people living there began to experience health problems including high rates of cancer and other diseases believed to be connected to Polychlorinated biphenyls. The state of Alaska's Department of Environmental Conservation, in cooperation with the U.S. Army Corps of Engineers, worked up a decontamination program and continue to monitor the site. 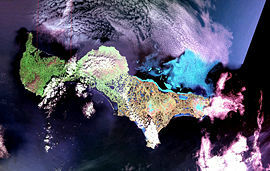 St. Lawrence Island lies in the northern reaches of the Bering Sea, near the Bering Strait, where North America and Asia make their closest approach. It is administered by the state of Alaska. The island is about 145 km (90 miles) long and 13–36 km (8–22 miles) wide. It has no trees, and the only woody plants are Arctic Willow, standing no more than a foot (30 cm) high. 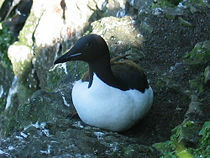 The island has an abundance of seabirds and marine mammals, due largely to the influence of the Anadyr Current, an ocean current which brings cold, nutrient-rich water from the deep waters of the Bering Sea shelf edge. During the nesting season 2.7 million seabirds are estimated to be found on the island. In early June thousands of auklets, eiders, kittiwakes, loons, murres,puffins, and many other seabirds either nest or pass through the island as they migrate to their arctic breeding grounds. To the south of the island is a persistent polynya, an area of open water surrounded by sea ice. The St. Lawrence Polynya is a persistent wind-driven polynya that forms along the southern coast of the island. The prevailing winds from the north and east push ice away from the coast, opening the relatively warm (-1.8 deg. C) water to the colder (-14 deg. C) air, where it quickly refreezes into a slurry of small ice crystals known as frazil ice. As of the 2000 census St. Lawrence Island was home to 1,292 people living in 347 households on a land area of 4,640.12 km² (1,791.56 sq mi). St. Lawrence Island is noted both archaeologically and historically for its important role in the development of Arctic cultures. It is thought to be one of the last surviving non-submerged portions of the land bridge that once joined Asia with North America during the Pleistocene period. The island holds five archaeological sites near the town of Gambell which represent two thousand years of life. These sites were critical in establishing the chronology of human habitation on the island. The prehistoric cultural phases of Okvik, Old Bering Sea, Punuk, Birnirk, and Thule, described by archaeologists based on excavations at the Gambell Sites, have provided a basis for other archaeological research throughout the Bering Sea region. Archaeological excavations of the five sites, named Hillside, Mayughaaq, Ayveghyaget, Old Gambell, and Seklowaghyag, began in 1927 and continued into the 1930s. They uncovered the first evidence of the prehistoric inhabitants of the island. Additional excavations at the Gambell Sites were undertaken in the late 1960s and the early 1970s. Otto Geist and Ivar Skarland of the University of Alaska Fairbanks conducted major excavations near both Gambell and Savoonga. Collections from these excavations are curated at the University of Alaska Museum on the Fairbanks campus. St. Lawrence Island was first occupied around 2,000 to 2,500 years ago by coastal people characterized by artifacts decorated in the Okvik (oogfik) style. Archaeological sites on the Punuk Islands, off the eastern end of St. Lawrence Island, at Kukulik, near Savoonga and on the hill slopes above Gambell have evidence of the Okvik occupation. The Okvik decorative style is zoomorphic and elaborate, executed in a sometimes crude engraving technique, with greater variation than the later Old Bering Sea and Punuk styles. The Okvik occupation is influenced by and may have been coincident with the Old Bering Sea occupation of 2000 years ago to around 700 years ago, characterized by the simpler and more homogeneous Punuk style. Stone artifacts changed from chipped stone to ground slate; carved ivory harpoon heads are smaller and simpler in design. The island was called Sivuqaq by the Yupik who lived there. It was visited by Vitus Bering, a Danish-born Russian explorer, on August 10, 1728, the feast day of St. Lawrence and thus named for the saint. The island was the first place in Alaska known to have been visited by European explorers. There were about 4,000 Central Alaskan Yupik and Siberian Yupik living in several villages on the island in the mid 1800s. They subsisted by hunting walrus and whale and by fishing. A famine in 1878–1880 caused many to starve and many others to leave, decimating the island's population. Nearly all the residents remaining were Siberian Yupik. Gathering of Yupik women in the town of Gambell, April 2005. 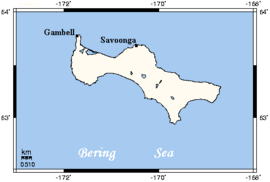 St. Lawrence Island consists of two villages, Savoonga and Gambell. According to the 2000 census, both villages had slightly under 700 inhabitants each. The two villages were given title to most of the land on the island by the Alaska Native Claims Settlement Act in 1971. The residents are 95.5 percent Native or part Native, mainly of the Yupik People. The island's isolation has helped them to maintain their traditional culture and language. Siberian Yupik (also called St. Lawrence Island Yupik) is the language spoken by the village people. It is also spoken in nearly identical form across the Bering Strait on the tip of the Siberian Chukchi Peninsula. Siberian Yupik is a distinct language from Central Alaskan Yup'ik and Alutiiq. Children on St. Lawrence Island still learn Siberian Yupik as the first language of the home. They continue to be a hunting and gathering society. Their subsistence lifestyle is based primarily upon marine mammals, along with polar bear and caribou. Their economy is based largely on subsistence sea harvests including seal, walrus, fish and bowhead and gray whales. Walrus-hide boats are used to hunt. In 1900 reindeer were introduced to the island. Today the herd numbers more than 10,000. The animals are used as a source of subsistence meat. Reindeer harvests take place, but the herd is not managed. The St. Lawrence Island Yupik are well-known for their skill in carving, mostly with materials from marine mammals such as walrus ivory and whale bone. Gambell holds a whaling festival each spring when a whale is taken. Savoonga is hailed as the “Walrus Capital of the World” and a Walrus Festival is help each spring. As a result of having title to the land, they are legally able to sell the fossilized ivory and other artifacts found on the island. St. Lawrence Island is approximately 125 miles west of Nome, Alaska, with the northwest end of the island being less than 40 miles from the Russian mainland. During the Cold War period the island's residents were exposed to a range of contaminants from U.S. military sites that were in use from the early 1950s to the early 1970s. The Northeast Cape Air Force Station was an Air Force facility consisting of an Aircraft Control and Warning radar site, a Security Service listening post and a White Alice Communications System site. It was located on the island's northeast cape. The area surrounding the Northeast Cape base site had been a traditional camp site for several Yupik families for centuries. After the base closed down in the 1970s, many of these people began to experience health problems. Decades after the close of the base, people who grew up at Northeast Cape have high rates of cancer and other diseases, believed to be due to PCB exposure around the site. 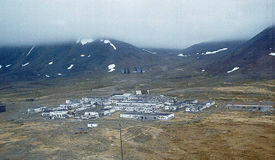 The state of Alaska debated the results of the 2002 study, stating that the contamination rates were in the range of other Alaskan and non-Alaskan arctic natives of similar age who were not exposed to a similar Air Force facility. The state does, however, support clean up of the site, which falls under the jurisdiction of the U.S. Army Corps of Engineers in conjunction with the Alaska Department of Environmental Conservation. The majority of the facility was removed in a $10.5 million dollar cleanup program in 2003. Monitoring of the site will continue into the future. ↑ 1.0 1.1 Alaska Travel Industry Association, Far North Community: St. Lawrence Island. Retrieved February 9, 2009. ↑ Robert Drucker, 2000, St Lawrence Polynya, University of Washington. Retrieved February 9, 2009. ↑ United States Census Bureau, Census 2000 Summary File 1 (SF 1) 100-Percent Data. Retrieved February 9, 2009. ↑ University of Missouri-Columbia Museum of Anthropology, Tools and Implements: St. Lawrence Island and the Bering Strait Region. Retrieved February 9, 2009. ↑ National Park Service, Gambell Sites, Nome County, Alaska. Retrieved February 9, 2009. ↑ William Cashen, May 7, 1966, Skarland Hall Dedication, University of Alaska Archives. Retrieved February 9, 2009. ↑ Alaska Native Language Center, 2008, Siberian Yupik/St. St. Lawrence Island Yupik (Siberian) Yupik. Retrieved February 9, 2009. ↑ Alaska Community Action on Toxics, October 2, 2002, PCB's in People of St. Lawrence Island, Chemical Body Burden. Retrieved February 9, 2009. ↑ State of Alaska Epidemiology Bulletin, February 6, 2003, PCB Blood Test Results from St. Lawrence Island. Retrieved February 9, 2009. ↑ State of Alaska, Contaminated Sites Program - St. Lawrence Island. Retrieved February 9, 2009. Collins, Henry B. 1937. Archaeology of St. Lawrence Island, Alaska. Washington, D.C.: Smithsonian Institution. OCLC 41798661. Geist, Otto William, and Froelich G. Rainey. 1937. Archaeological excavations at Kukulik, St. Lawrence island, Alaska. Washington, D.C.: U.S. Govt. print. off. OCLC 2175223. Hein, Tara. 2004. Tools and Implements: St. Lawrence Island and the Bering Strait Region. University of Missouri. Retrieved January 29, 2009. State of Alaska Department of Environmental Conservation. Contaminated Sites Program, Saint Lawrence Island. Retrieved January 29, 2009. Whitridge, P. 2000. "The Hillside Site, St. Lawrence Island, Alaska: An Examination of Collections from the 1930s, by Don E. Dumond." American Antiquity. 65: 774. OCLC 200858763. History of "St. Lawrence Island"
This page was last modified on 24 February 2009, at 06:34.